The incredible follow-up to Crank is finally here. Chisel a new physique and burn even the most stubborn belly fat using these challenging metabolic resistance training workouts and metabolic finishers. You already know that metabolic resistance training is the best method to shed even the most stubborn fat. But when you combine metabolic resistance training with metabolic finishers, you’ll shed fat even FASTER. The fat-burning metabolic conditioning circuit in Workout C (and yes, you even have a metabolic finisher in there too, to burn even MORE fat. Test drive this Metabolic Resistance Training program for a full 8 weeks with absolutely NO RISK so you can see for yourself how much fat you can lose without ANY long, boring cardio. You are protected by my 100% Money-Back Guarantee. I guarantee you will be thrilled, amazed and addicted with these fat-burning workouts, or you can simply email me for a prompt and courteous, no hassles, no questions asked 100% refund. P.S. There is NO RISK at all for you to try this Metabolic Resistance Training program. 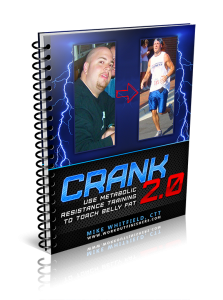 If you are not thrilled with Crank 2.0 in 60 days, let us know and we’ll refund every penny. Your satisfaction is 100% guaranteed. My workout programs have already been seen on Men’s Health, Turbulence Training and used by thousands of men and women, and I guarantee it will work for you, too.